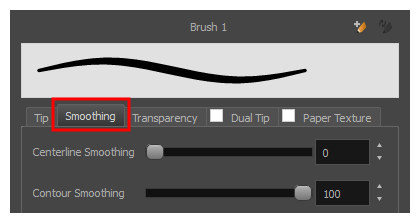 If you are drawing on a vector layer, the Brush Properties dialog will have a Smoothing tab, which allows to configure how Harmony automatically smooths your brush strokes. If you are drawing on a bitmap layer, this topic is not applicable, as bitmap layers do not support automatic smoothing. In the Brush Properties dialog, open the Smoothing tab.